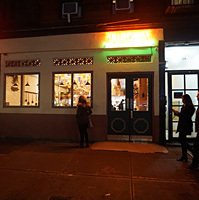 Head to the Thai countryside at Talad Wat in Hell's Kitchen. Inspired by Thailand's temple festivals, the restaurant by David Bank (of Pure Thai Cookhouse) and Brian Ghaw (of Feast) is a celebration of Thai cuisine, a "community pot luck" of sorts. The menu has an entire section dedicated solely to eggs; hard boiled with a shallot fish sauce, steamed with scallion, fried hard boiled with tamarind chili sauce, and a Thai omelette with cha-ohm (a member of the pea family) and fish sauce. Hot sauce here is made fresh daily and is truly "hot." It should be treated with respect. It's served with raw and pickled vegetables. The main menu is a "pick and mix" event, a chance to try one, two or three small plates with a serving of rice (jasmine or red). We tried fried mackerel served whole (and appears to be grinning). It's simple and eaten with just a spritz of lime. 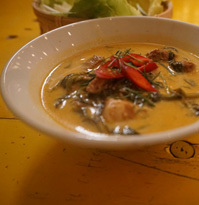 Pork belly arrives in a lively Tapoh curry with water spinach, kaffir and coconut milk. Both are excellent. Other offerings include pork stew in 5 Spice broth, winter melon soup, chicken with turmeric chili, whole butterfish with sea salt & garlic, and sautéed shrimp with shrimp paste, longhorn chilis and fresh string beans. Drinks include a refreshing lemongrass iced tea. Bright yellow picnic tables are meant for sharing and are perfect for larger groups. Talad Wat is one of the most welcoming places we've found and worth seeking out!